I really couldn’t decide whether to post this photo. After the success of my Double Chocolate Cardamom & Rose Cake, and so many lovely comments about its elegance and beauty, these crudely thrown together kebabs felt like a bit of an eye sore. 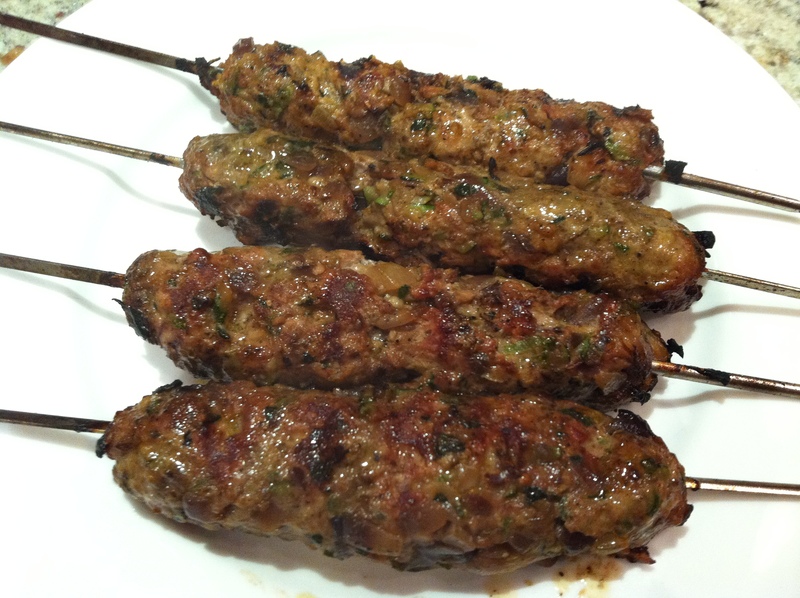 They were far more rough and ready; simple skewers of spiced minced meat wrapped around a stick. And in all honesty, if asked to conjure up an image of beauty in food, meat on a stick probably wouldn’t be your number one choice. Or maybe it would. I’m sure a food stylist could have drizzled them in creamy yoghurt and sprinkled over some chopped mint, found some suitably colourful prop to offset the darkness of all that meat and tinkered and tweaked until they had a plate that looked the picture of foodie beauty. But I’d made these kofte for a friend on a work night, and after we finally got around to getting them off the BBQ, sizzling hot and smelling divine, the last thing I wanted to do was faff around taking proper photos. This is real life, and sometimes hunger wins out over art. So why did I decide to post these pictures? The answer’s pretty simple really; the recipe is too damn good not too. To go back to why I made this recipe in the first place, I’ll rewind a couple of weeks. A lovely lady from innocent‘s PR team got in contact to see if I’d like to visit, and review, the Hungry Grassy Van; a kind of innocent branded meals on wheels, serving healthy food with hidden veg to the hungry masses. Unfortunately I was working that day and had to turn down the invite, so she offered to send me a copy of their new recipe book, Hungry, instead. I’ve already written about my near complete inability to say no to recipe books, and I was interested to see what innocent were trying to achieve with this new brand extension, so decided to accept. When the book first arrived, I wondered if the PR people had actually read my blog. Hungry seemed very much a book for families, filled with fun-packed ways to get your kids involved in cooking, trying new things, eating more veg. Carniverous Boyfriend and I may be in our mid-twenties, but we’re definitely not ready to enter the sleepless nights, baby wipes, mashed banana stage of our lives quite yet. However, after having a proper browse through the book, I loosened up a bit and realised there were actually quite a few things I’d like to cook. In the same way that innocent smoothies took a super simple idea (blend some fruit, get your five-a-day) and made their millions, this book takes basic ingredients and suggests recipes you might (shock horror) actually want to make. Being a blogger, it’s easy to pick and choose what you write about. I love my food, but can be a pretty picky eater at times – I was vegetarian for most of my teenage years (I can hear Carniverous Boyfriend shaking his head in disgust), and even several years into fully-fledged meat-eating, there are a few things I find it hard to like. Lamb is one of those meats that always provokes an opinion in people; those who like it wax lyrical about the delicate flavour and juicy texture, while those who don’t focus on the strong, gamey taste and animal overtones. I have to admit that I’m more lamb fusspot than hotpot, so when picking a recipe from Hungry, decided to put myself to the test and make something lamby. It’s a recipe book for kids right, so what better place to start? The result of my experiment is these lamb kofte. I know they’re made with mince so I might not be ready quite yet to chow down on the real fleshy deal, but I definitely feel I’ve moved one step closer towards the lamb-loving tribe. The recipe is simple to make and absolutely packed with flavour – ground spices sing against the strong flavours of the meat, lifted by a pinch of paprika and kept beautifully moist by the addition of softened, grated courgette. I cooked the kofte on our BBQ, resulting in beautiful black scorch marks, crispy nuggets of caramelized meat and onion, and a smell so divine that any fears over what I was about to eat disappeared out the window. If you love lamb, you’ll love this recipe. If you think you don’t, give it a try. You might just surprise yourself. Are there any foods you really love or loathe? As always, I’d love to hear about them. Toast the cumin and coriander seeds in a dry pan until lightly browned then crush to a powder in a pestle and mortar. Add a drizzle of oil to your pan and sweat the onion and garlic for around 5 mins. Add the grated courgette and cook for another 5-10 mins until soft. Set aside to cool. Put the minced lamb, paprika and powdered spices in a bowl and mix well. Add the lemon juice, mint and cooled onion and courgette mixture and scrunch together with your hands. Divide the lamb mixture into four, then form into sausage shapes and poke a skewer through the end of each one. Pop in the fridge for at least an hour to firm up. When ready to cook, put the kofte on a smoking hot BBQ (you can also use a griddle or frying pan) and cook until nicely darkened on all sides, aroun 10 mins. 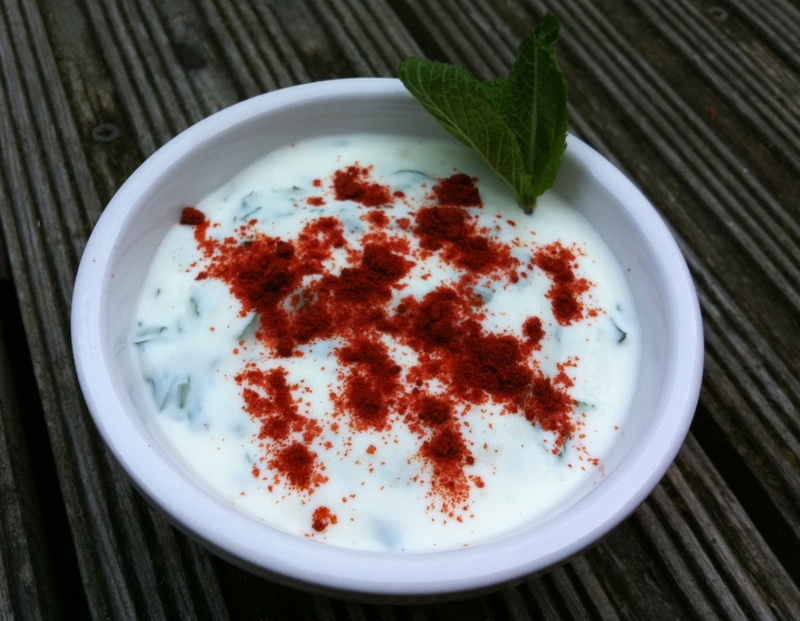 Serve with warm flatbreads, a drizzle of minty yoghurt, fresh chopped salad and a sprinkle of chilli if you like. Lamb isn’t my favourite meat but I do love lamb kofte and this kind of meal is my favourite; lots to pick on and nibble! The koftes look very professional too – like you’d been making them all your life! They look bloody marvellous to me! Not at all, I think they look fantastic and incredibly delicious. I adore my lamb kofte curry – I shall have to post it. Lamb just works so well for this sort of this, it doesn’t dry out at all. I really enjoyed your blog. Very readable and funny. Koftes look great too. I like my food rustic. I’m a big lamb fan. But have never eaten a kofte of any description because everyone seems to think they need minced up bell peppers in them and the one food I cannot abide are peppers. I’ve hated them since childhood and they get slipped into all kinds of things and just ruin them. I’m so excited to try this! As much criticism as you give your own photograph, it totally had me sold that this recipe was going to be a winner. I love kofte! I made beef kofte, little meaball sized ones on toothpicks, for a mezze challenge in 2010. However, they look nowhere near as good as your beautiful lamb koftes, so juicy! London Bakes – thank you 🙂 I was really worried they might fall off the skewers, especially when my boyfriend got impatient and started poking around at them, but chilling in the fridge seemed to do the trick! 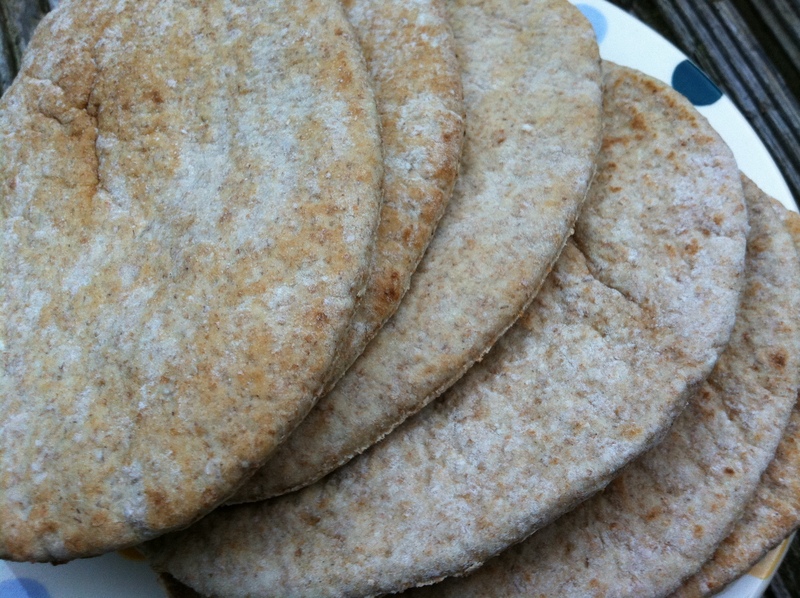 Frugal Feeding – yep, it was really nice and moist. Think the addition of grated courgette made them even more juicy too. Miss South – I like peppers, but not sure how good they’d taste in a kofte. Definitely stick with these and keep your kofte pepper free! Jenna – thank you 🙂 Hope you enjoy them as much as I did. The lamb kofte photo has got my tummy rumbling, the ultimate compliment surely! Yum!!! I absolutely adore lamb kofta. I grew up eating it, and I swear it’s one of those things I crave on a weekly basis. Yours look really nicely cooked. I made these tonight for tea, but made them into meatballs and stuffed wholemeal pitta bread with them along with salad and the mint yogurt. I forgot to buy mint but had mint sauce which I believe worked just as well. I also made some potatoe wedges spiced with paprika and spiked mayo with chipotle and smoked paprika paste to dip the wedges into…delish!! !